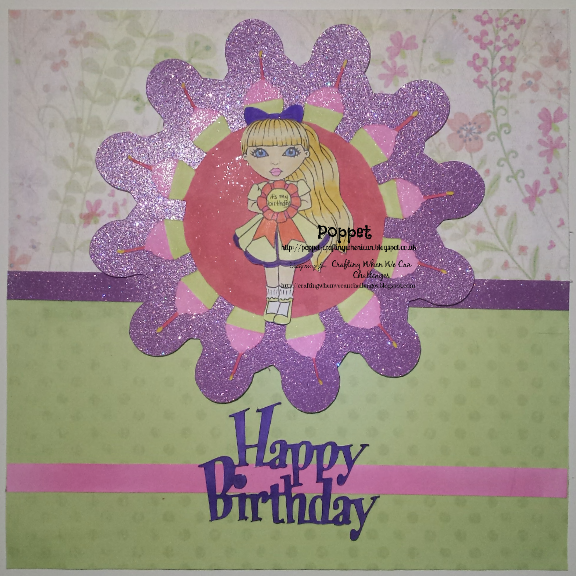 It's birthday time over at Crafting When We Can Challenges and was having probs with my blogger and totally forgot to post my card. So here it is (you have until next Saturday UK time to link you birthday creation). To start with I created a frame of cupcakes to go around my image using the SVG function in CraftArtist and the Scan'n'Cut to cut the file. I then added an offset to mat the cupcakes using Create and Craft glitter card. The background papers are from a CWVC paper pad. The image and cupcakes were coloured using Spectrum noir pens. The image is It's my birthday. The sentiment is one from the scan'n'cut on board library. Hop over to CWWCC and show us your 'Happy Birthday' projects. It can be any form of project and as long as you follow the rules you will be in with a chance of winning the prize.